The twenty new shapes in our Tiles I Template Pack are specially crafted to work with Kaleidoscope Kreator's Print Multiple and Save as Pattern features for printing beautiful tiled designs on fabric or paper. Tile shapes come in 8- and 16-segment variations. Click here to view a short tutorial on using shapes from the Tiles I Template Pack to make patterned paper or fabric. 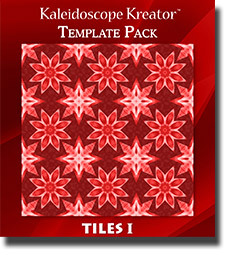 NOTE: The Tiles I Template Pack is an add-on product for Kaleidoscope Kreator 3, and can only be used if Kaleidoscope Kreator 3 is already installed on your computer.